With ethereal technique and gripping dramatic power she electrified her audiences. 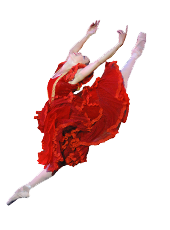 Balanchine recreated Firebird for her when she was just 17. Barishnikov chose her as his partner. Tudor and Robbins made her their muse. Principal Dancer at both New York City Ballet and American Ballet Theatre, she inspired her generation. Now she inspires the next. Ms. Kirkland currently co-directs the Gelsey Kirkland Academy of Classical Ballet in New York, NY. Photo by Eduardo Patino.